A smartly designed, professional Phoenix trade show display can make the difference between failure and success at your next trade show or industry convention. That’s why many experienced exhibitors turn to ExpoMarketing – the experts in the rental booth market. Since 1991, we’ve been providing businesses throughout the U.S. with rental trade show booths that provide a custom look and feel while avoiding the high cost of booth ownership. As the pioneer in the rental booth space, we carry one of the largest rental inventories in the country. Our award-winning rental booth designs provide a cost-effective alternative to owning a booth while making a powerful visual impact at any trade show or convention. • Makes it easy to change the size and design of your exhibit between shows. • Avoid additional fees for maintenance, refurbishment, pull and prep, and storage. ExpoMarketing offers many different booth sizes and styles – all with virtually limitless customization options – to choose from. 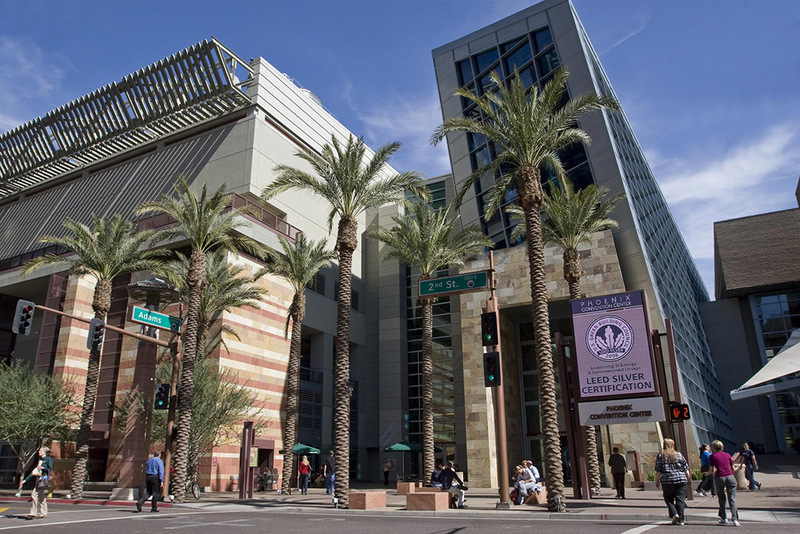 Located in the center of Phoenix’s walkable downtown district, the Phoenix Convention Center & Venues was recently named one of the top 10 convention center facilities in the U.S. The facility offers close to a million square feet of meeting and exhibition space, while the stacked floor plan allows for multiple events to be hosted at the same time with minimal impact to exhibitors and attendees. The Phoenix Convention Center is within walking distance of 3,000 hotel rooms, with 3,000 more situated along the city’s convenient Metro Light Rail System. Just minutes away from a 2,300-seat symphony hall and the historic Orpheum Theatre, the center is also in close proximity to a wide range of arts, dining, sports, music and other entertainment venues, including the renowned Roosevelt Row art district. Only four miles from Sky Harbor International Airport, the center provides quick and easy access for convention attendees. From concept to completion, ExpoMarketing provides a proven process for building an eye-catching exhibit that captures your prospects’ attention – and their business. We start by designing a booth that presents your brand with polish and style. We rent furniture, flooring, lighting, A/V equipment and other booth essentials. We also provide in-show advisory services to ensure a smooth, trouble-free exhibiting experience.